Have you been wondering how the High Plains Museum’s current exhibit Earth From Space relates to you? Earth From Space is a poster exhibit that features images captured by Landsats. Landsats or land satellites orbit the Earth and take pictures from all over the planet. These pictures include environmental changes, urbanization and weather systems. One of the posters, Global Weather and Storms, shows three hurricanes approach North America. Meteorologists use Landsats to track weather systems like this. One such weather system that was caught by a Landsat was the storm that produced the devastating tornado in Moore, Oklahoma this past week. 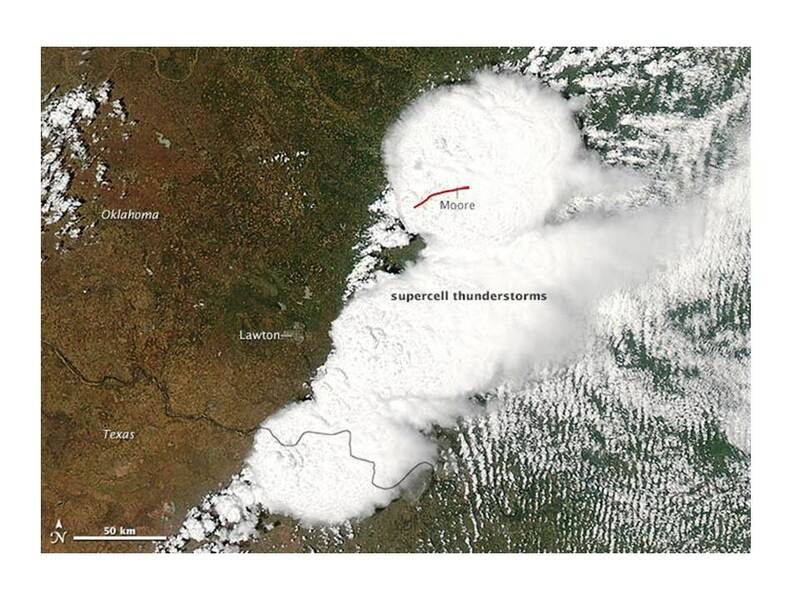 The picture on the left shows what the Landsat MODIS captured. This storm would eventually create an EF5 tornado that was over a mile wide. Images like these can help meteorologists track the storms that could hit communities like ours. Landsats play an important part in helping keep us safe or at least alerting us to possible dangerous situations. Come check out our exhibit Earth From Space to get a better view of our Earth and learn more about the amazing satellites circling our planet. ← June has Jupiter sized fun!